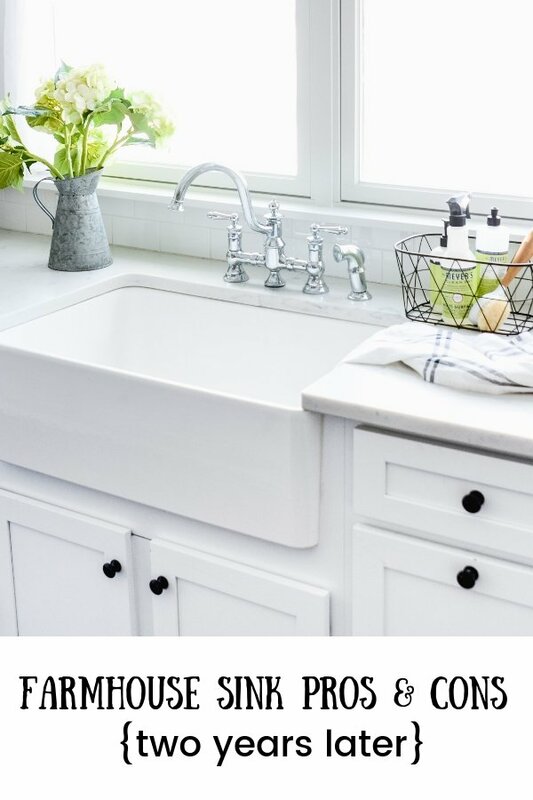 Love the way farmhouse sinks look, but wanting more info on how it holds up? 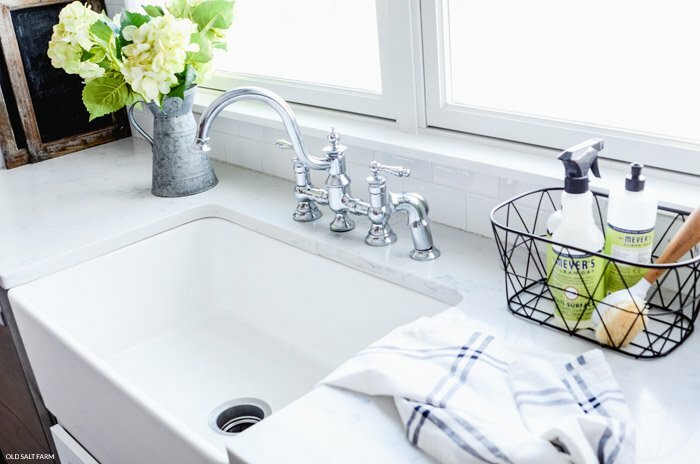 Here’s my list of farmhouse sink pros and cons, after two and a half years of use! 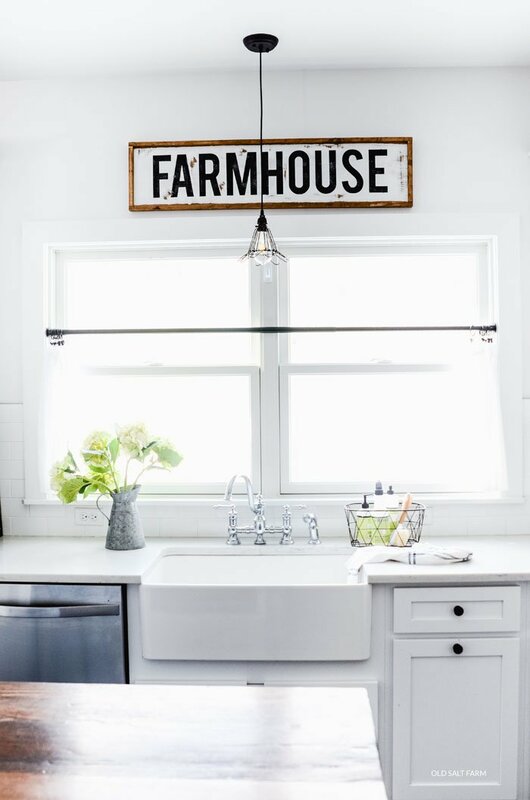 When we were building our home, one of the things I knew that I absolutely wanted in our kitchen was a farmhouse sink. 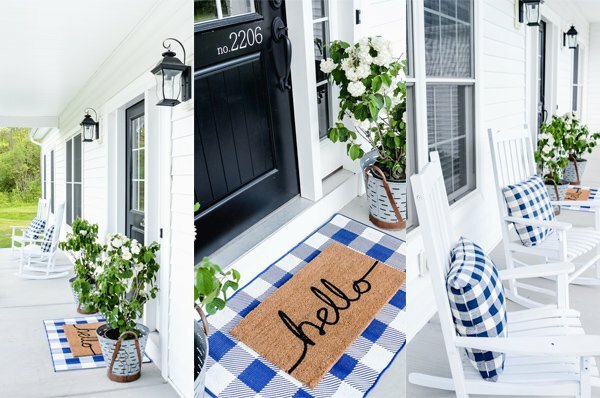 I just adore the way they look, and the farmhouse charm that it adds to the entire space. It’s such a focal point of our kitchen, and I still love it so much. Now that we’ve lived here for two and a half years, I can also speak to how it’s held up over that period of time. With eight people and six kiddos in our house, it gets a lot of use…and not always very gentle use! Large, Single Sink: I absolutely LOVE the large, single bowl sink style. I had always had a double sink before, but I knew going into it that I would love it. I have a lot of large pans and dishes that I use on a regular basis, and it makes washing them a breeze. Cookie sheets, crockpot inserts, large pots, baking dishes…they all fit easily in the sink to either wash or soak. No more soaking big dishes on the counter (which inevitably made a mess)! When I wash things by hand, I just a soapy dishrag, then rinse under the water. I dry them on the side of the sink on a large towel, or dry by hand if I want them put away quickly. Not once have I missed a double sink, and I don’t think I could ever go back! 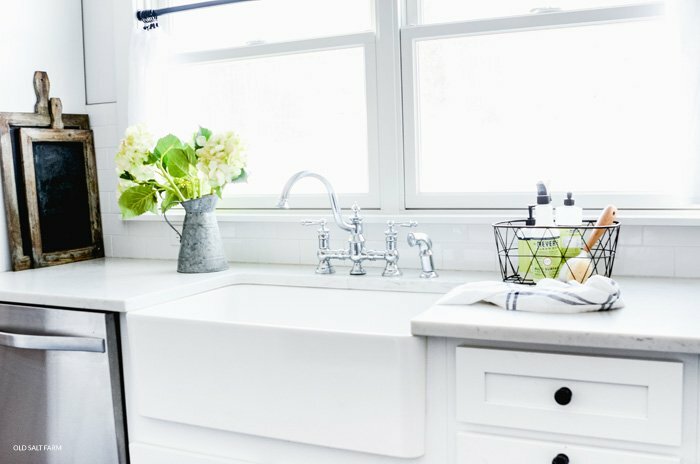 If you are hand washing most or all of your dishes every single day, then possibly not having a double sink could been an issue for you. But if not, having that extra space is a dream! Durability: The durability of the fireclay is a major plus for me. I have six children, five of them being 10 and under, and so it gets a lot of rough use every day. SO many dishes have been dropped in that sink, and it’s held up beautifully. Some people add a pad to the bottom of their sink just in case something is dropped, but I don’t like it. Easy to clean: I have found the sink very easy to keep clean, overall. It is white, so I always make sure to clean it right away after rinsing or washing out certain foods, like spaghetti sauce. I do have to wipe it down pretty much everyday, or it starts getting a ring around the edges. I’ve battled with other types of sinks, and I’ll take this one over stainless steel any day! While it needs to be wiped down often, it cleans easily, and I don’t have to do a lot of scrubbing. Style & aesthetic: This is a huge plus for me! A sink is a practical item in your kitchen, but it’s also a focal point. It can add to the overall style of your kitchen and your home, and I love what it adds to the aesthetic of the room. 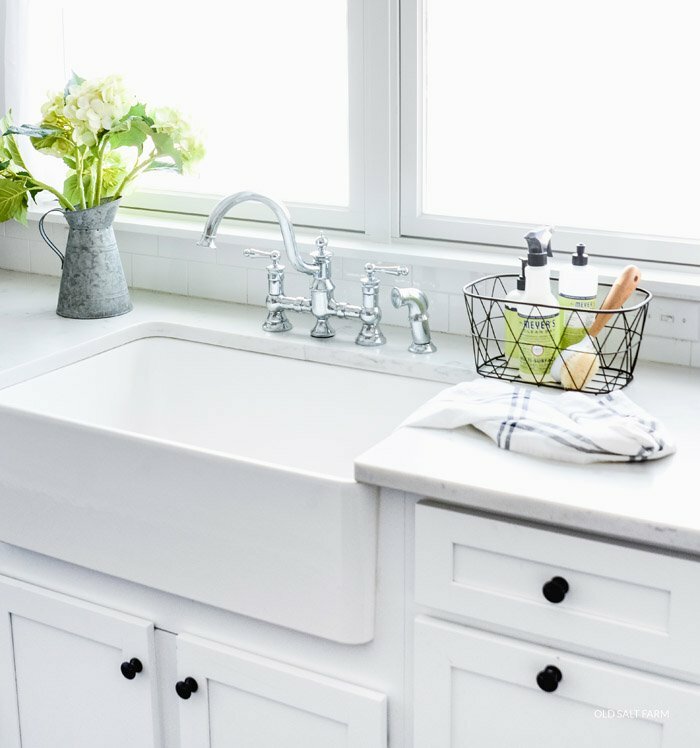 The beauty of a farmhouse sink is that it definitely has farmhouse style, but it works with other styles as well. They’re just gorgeous! 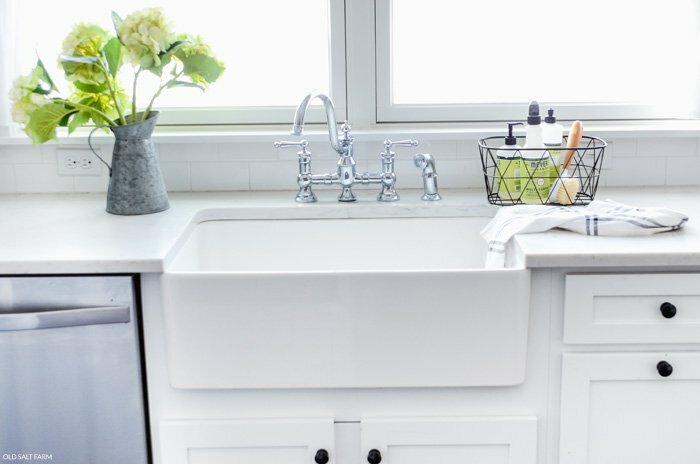 Price: Farmhouse sinks aren’t inexpensive. I knew I wanted one, so we budgeted accordingly and made it work, but it’s something to consider. I do know IKEA sells them at a lesser price, and here are a few reviews if you’d like to check them out. One major difference is that the IKEA farmhouse sink is topmount, and mine is undermount. An undermount sink is seamless with the countertop, while the topmount sits on top. No double sink: Like I said above, this is not a con for me. I way prefer having one large sink over a double sink. However, I know this may be an issue that some of you are thinking about. I think the only way I would miss a double sink is if I was hand washing most of my dishes on a regular basis. And even then, I would have to think long and hard about it! At the end of the day, it would be a resounding YES to the question of whether or not I would do it again. I love everything about it, and it’s proved to be durable and beautiful at the same time! I ordered my farmhouse sink through a local plumbing company, but THIS OPTION is just like it. Have a happy day, my friends! You can always find me on Instagram…come by and say hi, I’d love it! Our Painted Basement Ceiling…and why we love it!